The staff of the Society is available to provide information about the holdings of the Society and to answer research questions. The staff researcher can also help with translations of articles from French to English. Researchers who are unable to visit the library can use the research form to request information or copies of documents. Requests are answered in the order they are received and may take several weeks to complete. Payment should be made in advance by cash or check. 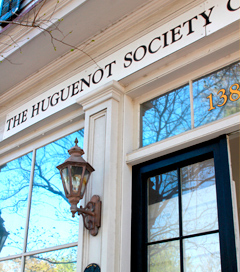 The Huguenot Society of South Carolina’s research facility is located at 138 Logan Street in downtown Charleston. For more specific information about the library and/or research, please contact the staff researcher via email or at (843) 723-3235. Consultation with the staff researcher can be arranged by appointment as well.